Disclosure: I received a 3 month membership in exchange for a review. 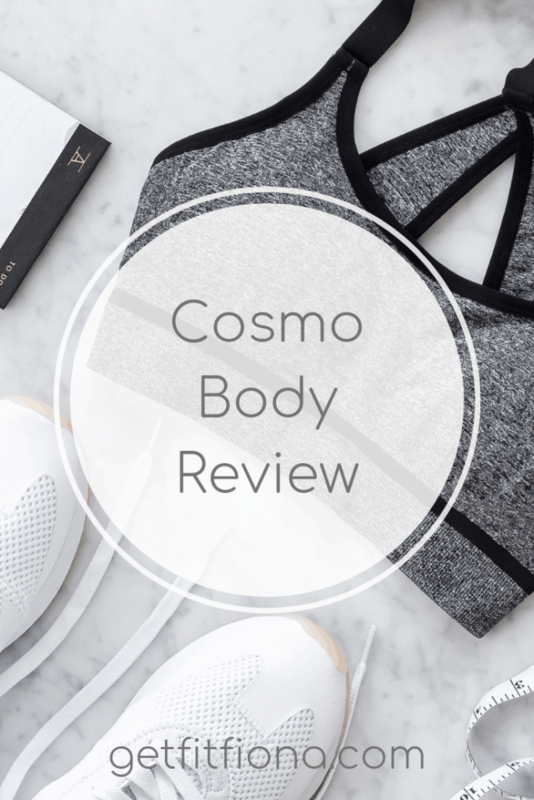 Today I wanted to share my experience with Cosmo Body. In case you haven’t heard of it before, Cosmo Body has all kinds of video workouts that you can access through their website or their app. I’ve been using their app on my ipad and really enjoying it. It’s a lot easier to use my ipad than my laptop when it comes to workouts. First off, they have workouts that will suit just about anyone. No matter what you’re into, you’ll find something that interest you. Their workouts are organized into different categories – cardio, dance, strength, yoga, interval training, and under 15 minutes. Once you pick a category you’re shown the the titles, length, and difficulty rating for the videos. I found the difficulty rating particularly helpful in picking which videos I wanted to do. If I wanted something on the easier side I’d go with a beginner video, if I wanted something tough I’d pick intermediate. Most of the videos were about 15 minutes, though there were some longer and some shorter than that. I found I got the best workout when I combined 2 or 3 of them that focused on different body parts to get a full body workout. I tried workouts from all the different categories, though I have to admit I didn’t finish the one dance video that I tried. I don’t know what it was, but my uncoordinated self just couldn’t keep up with the instructor. Luckily that was the only category I had troubles with. My favorite workouts were the strength and interval training categories. Cosmo Body has 8 trainers that do all the videos. If you really like one of them you can also find all of their workouts in one section. Tara Stiles does the yoga ones. If you’ve spent any time at all in the yoga community you’ll have heard of her and know that she’s a legit yogi. You can also find all the workouts that you’ve done under the history tab, so if you really liked one you don’t have to try to go searching through all the videos on Cosmo Body to find it again. If you’re on the go and away from home, I think Cosmo Body would be pretty awesome to keep you on track. If you have access to the internet you can stream the videos. Many of the workouts had minimal equipment or none at all (the one I did yesterday didn’t have any it was a body weight workout), which is perfect for when you’re travelling. The only thing I didn’t like was at the end of the videos. The trainer (and their assistant if there was one) would talk about what they were wearing and what brand it was from. Personally I was watching the videos for a workout, not to find cute workout clothes, so I wasn’t all that interested in it. Maybe other people like it though? If you’re interested in giving Cosmo Body a try you can use COSMOBODY20 to save 20% on monthly subscription through 2015 and COSMOBODY59 to get 1 year for only $59 (over 50% savings). Have you tried CosmoBody? Leave me a comment with what you thought of it.